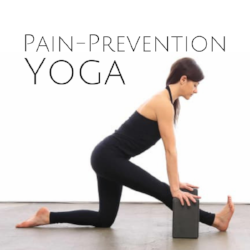 Pain-Prevention Yoga is just that: a workshop series that will educate you on how to adjust YOUR body for less pain, more flexibility, and greater strength during your yoga practice as well as off the mat. On October 13, the focus will be on relieving tension in the neck, shoulders, upper back and wrists with yoga poses, stretching, and pranayama (breathing techniques). If you have suffered from shoulder of neck pain or if you would like to improve your posture, this is the workshop for you. You will also learn specific tips for relieving pressure on shoulders and wrists through positioning and strengthening. On October 27, the focus will be on relieving low-back and hip pain and hamstring tightness with yoga poses, props, and pranayama (breathing techniques). If you have suffered from hip bursitis or back pain, this class will teach you how to incorporate a daily yoga routine that will prevent these painful conditions from returning. This session is especially helpful for runners and walkers looking for a balance to their regular workouts. Each class will include detailed, hands-on instruction, plus take-home yoga sequences, articles, anatomy demonstration, meditation and relaxation with lavender oil massage. You can come to both classes for maximum benefit, or choose one that deals with your specific issues.